Not sure if this is a right place to ask this question, but I'll have a go. What do you call the ends of an apple, as in, the branch side, and its opposite side where it's caved in? The ends don't appear to have technical names, but the parts at each end do. The stem is also called the pedicel or stalk. 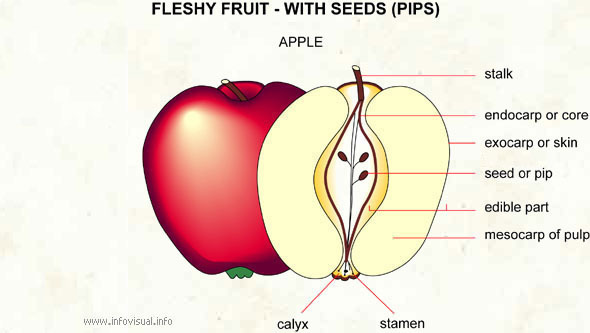 The opposite end is where the stamen is located. In the second picture below, this end is also referred to as the style. 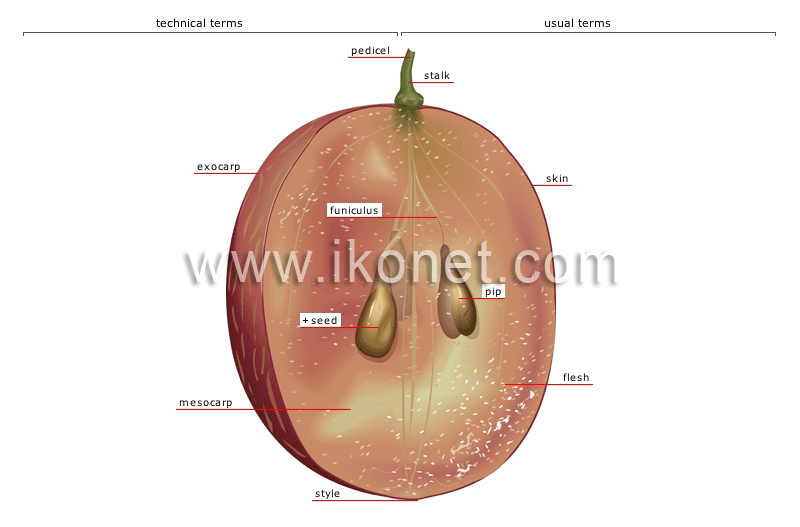 None of these terms are common outside of technical usage when discussing plant, flower, and fruit morphology. More common descriptors are stem end and tip. By the way, some pictures will show the "calyx" (derived from "cup" or "chalice"), often at the tip end. But I believe the calyx is a depression at either end. Referring to a particular calyx requires a modifier (e.g., pedicel calyx). It is in no way specific to apples, indeed it is rarely applied to them, but poles of the apple might work. each of the extremities of the axis of the earth or of any spherical body. I don't know of any specific words for each of the two poles. Indian sculpture is composed exclusively of inflected surfaces; concavities, like the poles of an apple, are the meeting places of convex lines (see Rawson’s analysis, 1966). John Bunker, who is one of the key people involved in apples for FEDCO, a well-known organic seed/tree company, seems to call the dip in the top the "cavity" and the dip in the bottom the "basin" in his book Not Far From the Tree. I don't know if it's official, but it works for me. Incidentally, looking things up about apples online is very hard because of the computer brand! What is the word for something that is pronounceable when reversed? What is the word for words that oppose all the things they describe? What's the correct word to categorize/refer to the Top 1% in a distribution?